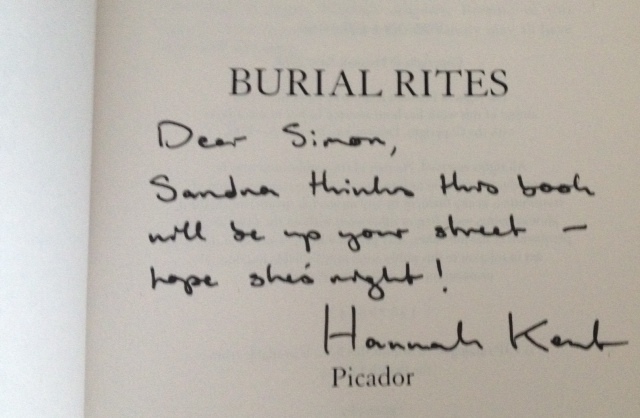 I have been dragging my heels about writing a review of Hannah Kent’s debut novel ‘Burial Rites’ for quite some time. Not because this is a bad book or one of those books that you read and promptly forget, quite the contrary, it is a book that I enjoyed (read loved) so much and found so powerful that anything I write about it will barely do it justice and so I will have to go and sit in a corner and sulk for the rest of the day. As I am quite good at sulking when the need arises, I will give it a whirl – though I am doubly cross with myself for losing the notes and page quotes I had on the book, all thanks to an iPhone resetting. But let’s discuss the book shall we rather than my insecurities or technological faux pas. 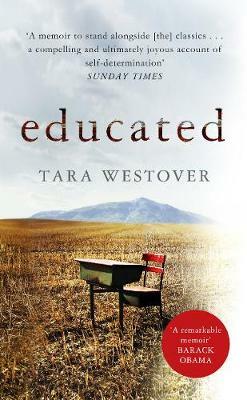 It is the late 1820’s in Iceland and the lives of District Officer Jon Jonsson, his wife Margret and daughters Lauga and Steina, are changed on their farm of Kornsá when the news that they will be housing a criminal in the lead up to her execution, for we are in times when prisons do not exist. The criminal in question is Agnes Magnusdottir who, many believe, killed ‘healer’ Natan Ketilsson and his neighbour along with Sigridur and Fredrik who are to be housed elsewhere for fear they will concoct some tale or escape. This is not only a time of no prisons but a time when the law simply states that you are guilty unless proven otherwise and with just three people’s word the likelihood, once the King across the sea grants it, is that you will be killed. It is from the time that Agnes is housed in Kornsa while she waits the final verdict and judgement that makes up the story of ‘Burial Rites’. As many of you may or may not know the actual case of Agnes Magnusdottir is a true one, indeed she was the last woman to be executed in Iceland, yet despite knowing that from the beginning as the novel winds on the more you hope that the outcome will not be the one it is (this happened to me again very recently with Meike Ziervogel’s ‘Magda’ which I can’t wait to tell you about soon) especially as Kent weaves her fictionalised version of events as to what Agnes’ life was like from childhood leading to her first meeting with Natan and what followed, which of course I will not spoil for you because the story of ‘Burial Rites’ to my mind is the story of the person behind the true story and Kent tells it beautifully. A good story is lost without great characters and atmosphere and Kent has these both in abundance. We spend the beginning of the novel away from Agnes yet hearing much about her through the mouths and tales of others. So when we meet her we already have a vision in our heads of some calculating witch. It is this same image that Margret and her daughters also have and so the very idea of having this woman sleeping in the same house as them is beyond terrifying and Margret is a hard woman at the best of times. Yet as the novel moves forward and they, and we, meet Agnes they start to question themselves and the assumptions they have made about her, especially as Agnes starts to tell her story to the visiting Reverend ‘Toti’ who has been sent on a mission to save her soul before she dies. The other aspect of the book I loved was Iceland itself, the atmosphere of the place is brought fully to life by Kent, who chose to go there after never having seen snow in her native Australia and there learnt of Agnes’ tale. Cleverly she never needs to describe the ‘other worldly’ sense of Iceland in great detail, she structures the scenery in short sharp sketches and it constantly broods behind every scene. Having been to Iceland myself (and shamefully having not shared that trip with you on the blog last year, why ever not I do not know) I could probably have pictured some of the setting but I stayed in Reykjavik with two little trips out into the sparse wilderness, nothing quite as sparse as Kornsá though yet I felt by the end of the book I had been there living out a winter with them all. The book also packs an emotional punch. As I mentioned earlier we know the outcome of the events from the start, as the countdown increases and the pages of ‘Burial Rites’ lessen in our hands the sense of dread increases and I have to say I found the end of the book incredibly moving. There is no question that Hannah Kent has crafted an incredibly beautiful novel with ‘Burial Rites’. It is a book which has a sense of isolation and brooding menace throughout and a book where the prose is as sparse (you feel not a word has been wasted) as the Icelandic landscape it is evoking. It is one of my books of the year without question and one lots of people can expect in their season stockings in a few months time. I strongly suggest you read it. 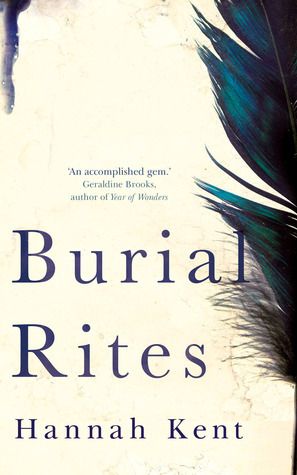 Who else has read ‘Burial Rites’ and what did you make of it? You can hear Hannah and myself talking about it (without spoilers) here. Which other books have you read set in Iceland, as I am a bit obsessed with the place – I have already cottoned onto Yrsa Sigurdardottir – and would love to read more novels and non-fiction alike set there, especially now the darker nights are here as its very Autumnal now in the Wirral.